As you might know we do not only design residential landscapes but we have the fortune to build them ourselves. This allows us to see that our designs hold their integrity throughout the process and it allows us to see the projects all the way through to completion. A good project is nothing without a strong design; however, our highly skilled construction team is one of the best in the area. Concrete is one of their specialties. With their years of experience at using the material, our design range has been able to widen as they prove time and time again that they can handle anything the designers throw at them. They have become craftsman that produce works of streamline perfection. With this insurance we continue to use concrete in the majority of our projects because of the multiple benefits. It has a natural “palette cleansing” effect. We believe that the softness and simplicity of the material allows other elements in the landscape to steal the attention. 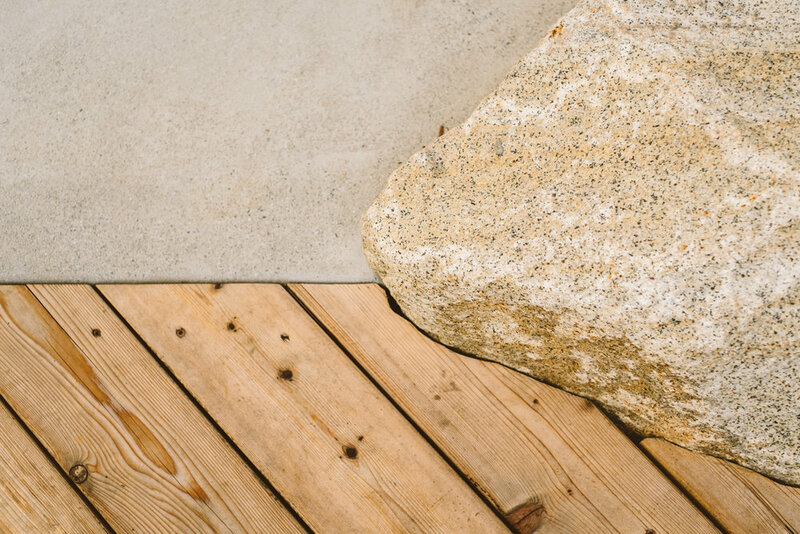 Unlike wood decking or flagstone and their busy characteristics, concrete can be made with few or any joints or cut lines, creating a seamless surface. Therefore our eye will never naturally fall on this surface but will be guided to another highlight within view. Concrete can either be poured-in-place or brought in from an offsite manufacturer. This flexibility allows the material to be used in any style. Concrete can be formed to create straight modern lines or curved traditional edges; it can be made into walls, countertops, or even ceilings. There is little concrete cannot do. Here at Falling Waters Landscape you name it and I am sure we have made it out of concrete. Our favorites that you will see most used are concrete steppers, these create an even plain that can be accented with ground cover or pebbles. We also use concrete for patio surfaces, retaining and seat walls, driveways, and another favorite: steps. Below are numerous projects of ours were we did not settle on the standard uses of concrete but stretched its capabilities into creating dynamic details within our projects.